Yes, this is our living room. Pathetic, isn’t it? But we could be poster children for Apple. 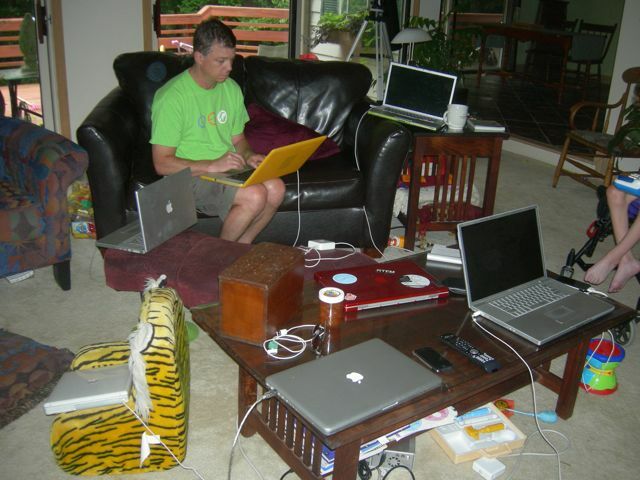 There are, count them with me, 1, 2, 3, 4, 5, 6, 7 Apple laptops in this picture. PC is a dirty word in our house. Did you find them all? Did you miss the little white one in the Tiger Tot chair? Or maybe the candy apple red one, or the tangerine one? Seven you ask, but we only have 3 people that actually use them.. Our critters get their own laptops!! No…. but I swear Toonces wants one. My inlaws are visiting which accounts for 2 of them. Two of them are Mr. Tot’s and mine, two more are previous laptops of ours that don’t hold muster for current standards, but work great for kids. And Mr.Tot managed to get a lovely crack in the glass of his latest laptop which Apple would not replace, but his boss did. So that makes SEVEN laptops. Seven apples, that’s more than enough for a pie. There are also 3 Apple iphones here, though not all visible. And NO, I don’t have one. Grandma and Grandpa are more with it than I am. Here is my phone…. I call it the X-phone. Notice the lovely packing tape, missing antennae cover and cracked screen…. Hey, it’s just a phone. It stills works…. what more do I need? Mr.Tot was desperate for me to want an iphone, so HE could get the new one and I could take his old one…. Problem solved. His iphone started malfunctioning though I can’ t imagine why…. And they replaced it. WIth another 2G iphone. Which he promptly put on ebay to sell for more than the 3G ones cost…. Don’t you want to be a Pepper own an Apple too?